Discussion in 'Mac Pro' started by Average Pro, Dec 24, 2013. - I can't think of anything more difficult or inconvenient than having to reach around or rotate the MP to remove or install a TB or USB cable. I have hired an efficiency expert to help organize my time in preparation for this new task. - I am one of the lucky few who got my old MP (oMP) with the photonic upgrade. Both the oMP and Cinema display power themselves by collecting electrons from the atmosphere - no power chords. In addition, the external HDs (FW800 & eSATA), monitor speakers, Compact Flash card reader, and monitor calibrator are powered and transfered files via Osmolusion. I can't begin to imagine the nightmare some of you go through who don't have this capability. - So let me get this straight. When I need to change a HD, I don't have to shut my system down and open it up? What a rip-off. I actually make up reasons to shut down my oMP, just so I can look and marvel at the inside. I despise expandability. In my house I have a Plasma/BluRay/Surround Sound/Router/MP3/Receiver all-in-one. Picked it up at Costco. 1) It's easier to turn aroudn than the old Mac Pro to get to the ports. 2)In truth, it's only cables for an optical drive and a box to hold the drives that were previously internal. And depending on what people do for peripherals, it could be the same number of cables. 3) Half right, not expandable internally, but has a decent number of external ports. It looks like a giant suppository which totally messes with my office's feng shui. Yeah, the complaints about a lack of ports on the font are rather silly. With a tiny machine that sits on your desk this just isn't nearly as inconvenient as with a full-sized tower sitting on the floor. In general I anticipate 80% less crawling around under the desk chasing down wires with this machine, despite the lack of front ports. As far as cable clutter... I anticipate less with the new machine. In several cases on the system the new Mac Pro will be replacing for me, there's a PCIe card that then has one or more external cables attached to it. This means the back of the machine just has way too much going on, and it's impossible to keep things neat. Several of these PCIe cards are being replaced with external Thunderbolt devices mounted in a rack under the desk. So there will be two or three Thunderbolt cables running out of the machine to the rack. There will be cables coming out of some of the devices on the rack, of course, but a) nice rack enclosures have cable management systems and b) things will be more spread out. I love the guy that always shows the picture of the nmp with all those peripherals. I think he thinks with one pic ppl will agree with him. Unfortunately it makes him look very petty. I'm bemused by the complaints that Apple should have put in faster CPU's. I love the image with the fabricated problem of multiple single bay external enclosures. Ya guys know you can put those four drives in just one enclosure, right? Yeah or even 8 drives, or buy a thunderbolt fibre channel link and hook it up to a SAN. I wouldn't say fabricated regarding the complaints. New MP - dearth of drive bays. You now need to use external drives, either NAS or DAS. NAS will not increase cable clutter since you'll be using the ethernet cable but suffer greatly from bandwidth. DAS will increase cable clutter that you did not have in the old MP. Never understood the cable complaint. 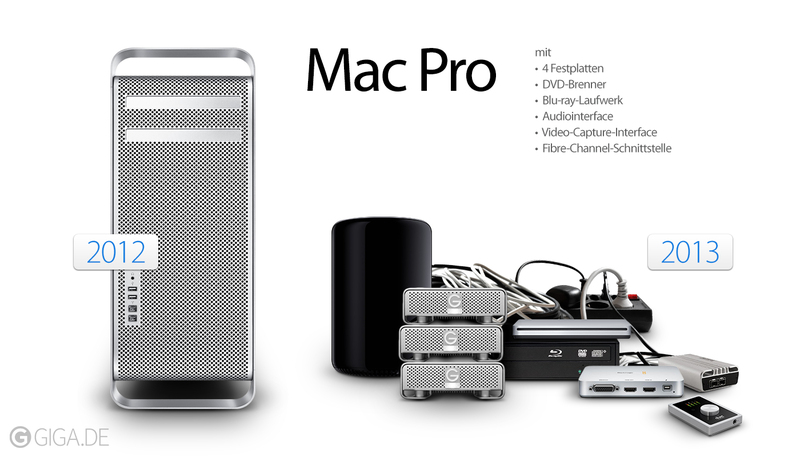 With my current Mac Pro I already have 11 cables coming out the back of it. Internal PCIe cards are normally going to have something out the back of them. That's some cable. It must've been fun to read the labels on the connectors to make sure you were plugging in to the right one. I just got a chance to play with the new MP at the Manhattan Beach (CA) Apple store. Let me tell you there will be no problem accessing the ports. This thing is so small and round that just a slight twist gives you access. Not a big deal; not even a little one. The model in the store was the quad core base and they had no stock for sale. They had FCPX loaded up on an Apple thunderbolt display. As you would expect, the machine is pretty fast on the stock Audi footage at HD resolution but you can't really test this thing at the Apple store. I went to look at the size and weight of it and touch it. It is small, shiny, massive and solid as a block of aluminium which is what it is. It does have that magic Apple quality of generating instant lust, I must say. For the fashion conscious, this dark grey thing looks odd in the store with the white keyboard and light grey trackpad. It begs for a backlit matching grey keyboard and mouse. 1. It should have unreleased Haswell XEONs in it at 4GHz+. 2. It should support 256GB RAM. 3. It should have an optical drive, floppy drive, card reader, 10 internal drive bays, a video capture card, an audio card, a built in screen, 4 CPU sockets, 6 double wide PCI slots, support up of 32 displays, make breakfast, and have rocket launchers..... AND be able to be used as an actual trash can. There is really no reason this is a ridiculue-able complaint. In the old MP, 256 was certainly with in reach, but granted expensive, with 8x32GB RAM config. You might not need and very few people probably do, but for those that do, its a deal breaker. Unlike other parts of the system, where when only 3.5GHz and not 4GHz, or only 200MB/s and not 1000MB/s, things will run more slowly, with RAM stuff just doesn’t work if you don’t have enough of it. Your sarcasm does not make you appear clever considering you seem to have no idea what kind expandability people are complaining about. I never understood the complaint about no front ports. You can easily rotate Mac Pro so it faces you all the time. There's no optical in front and the design is made in such a fashion, that basically there's no technical reason to differentiate between "sides", you know since it's cylindrical. Unless you mind the looks of course. So you wanted them to wait til the end of 2014 for Haswell Xeons? The Apple store has a 33 ft TB 2 cable that allows you to put all your devices as far away as you want. I'm planning on using it to put all the hard drives and whatnot off in a distant rack, as I don't have desk space. The rotation thing is a bit weird; I could see it working if all your cables go down through a cable management hole in your desk, and you have enough give in them that you don't end up tugging the cables. That said I'm not really sure why it's resulted in so many complaints; personally I'd probably just put it on my desk sideways, and make sure one of my connected devices is either a monitor with built in hub, or a standalone hub that I can plug things into instead. I mean, Thunderbolt may be hot-pluggable, but it still doesn't seem like there are loads of devices that require it, and most support daisy chaining anyway so you don't have to hot-plug directly into the Mac Pro unless you need the best possible speed. This is a complaint that depends heavily on the user of the machine; you can fit around six drives comfortably into a workstation Mac Pro, and you can definitely get enclosures that will hold that many, so that's one extra device. Other than that what do people need? Maybe one more if you need an optical drive. The main problem is for people with lots of specialist PCI cards they suddenly need to find new homes for. Even so, with external devices most people are going to end up taking up less space than a workstation Mac Pro did. Plus people have had tons of devices hanging off of those anyway (monitors, backup drives etc. etc.) so you should already have some kind of cable management by now already. Again, this is highly subjective as USB and Thunderbolt allow plenty of expandability. If want you want is upgradeability then sure, we don't know yet what the situation is exactly, though it's likely to have few upgrade options. I'm not a hater yet I think there's some truth to that complaint. The old MP could hold internally most of what you want. The nMP cannot. You have to now use a rack and take up office (or closet) space to hold the external drives because the nMP does not have the expansion bays. Additionally if you had an old MP, and everything set up with internal drives, you'll have to buy external drives which adds to the cost. Ohhh. I had a small suspicion, but it's difficult to tell around these parts these days. Additionally if you had an old MP, and everything set up with internal drives, you'll have to buy external drives which adds to the cost. If you have internal drives already from the oMP, then all you need is an enclosure, surely?